Belleek Typha jug is made of fine china with both hand-painted shamrocks and embossed detailing; it would be suitable as either a pitcher or a vase. Sorry, this Belleek pitcher is now sold out. Typha, a variety of meadow grass, originally adorned this Belleek pitcher in relief. Sometime in the early part of the 20th Century the Typha design was replaced with a spray of Shamrocks and remained popular until its retirement in 1980. The Belleek Typha jug is a shamrock design that features an embossed motif on both sides. The Belleek china pitcher stands 7 1/2" tall and it is offered as a limited edition re-introduction of 2500 pieces. 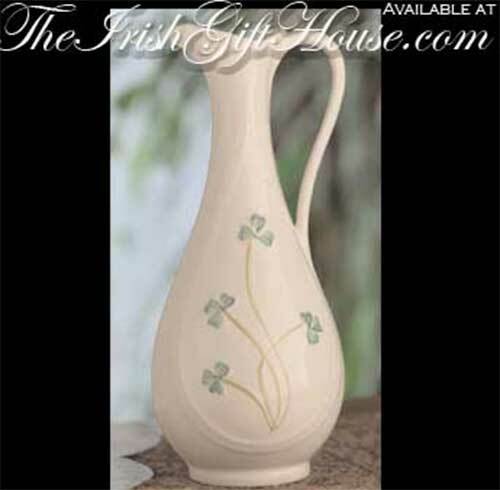 The Irish pitcher is made of fine china and is hand-painted and hand crafted in Belleek, Ireland. The Belleek pitcher is gift boxed with a shamrock history card, complements of The Irish Gift House.